Golmaal Again, the fourth installment in Rohit Shetty-Ajay Devgn’s Golmaal series, starts with Tabu narrating the childhood stories of Madhav-Gopal and gang - they were orphans and found home with Jamunadas who started an orphanage with our five stars as the first “batch” of kids. The story tells us what made the gang of five take different paths and what brought them back together. Golmaal is the screwball comedy franchise that has been kept alive for the last eleven years. Reruns on satellite channels always make you chuckle, no matter from which point you catch the film. Like its previous instalments, this one too has moments of unadulterated fun. The gags alternate between being truly funny and averagely routine but you find yourself laughing uncontrollably because each of the actors here is a delight to watch. Whether it's the lisping Lakshman (Shreyas) or the bully Gopal, who is petrified of ghosts, everyone is so proficient, you can't help but smile at their antics. The dialogue is pedestrian but witty. 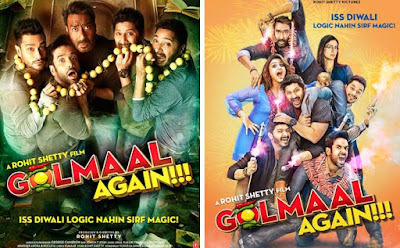 This movie involves digging up the past of the familiar infamous five - Gopal (Ajay Devgn), Madhav (Arshad Warsi), Lucky (Tusshar Kapoor) and the two Laxmans (Kunal Khemu and Shreyas Talpade) - and getting them to revisit their roots now as manchild adults. The quintet heads to their orphanage in Ooty to attend the prayer meet of its deceased owner. Here they encounter the librarian-ghost seer (Tabu) and the Kareena KapoorKhan substitute in Parineeti Chopra, whose job here is less to tickle the funnybone and more to smile as the house's caretaker. It takes no less than three seconds to deduce the twist but then again suspense and intrigue are not Shetty's forte. What he's known for are flying stuntmen, high-flying cars, slapstick humour and lowbrow wordplay. He has cut down on the cars in the fourth Golmaal but uses the others excessively to present a loud horror comedy, one that of course refers to Ram Gopal Varma, Vikram Bhatt and Bipasha Basu. If you are looking for substance, then this one has no logic, only magic. But, if you're looking to just laugh and be merry, Golmaal will again do the trick.